Barbara and I have successfully worked together to acquire a rental house for me. Barbara works tirelessl and is an absolute gem! She sets a standard for excellent performance that gives the industry and your office a great reputation. It's my pleasure to continue to work with her as my agent. I must say that I don't believe that we have every worked with an agent as accommodating and thorough in her presentation of available properties as Barbara. In addition, when we made suggestions regarding properties we had seen in ads and in MLS listings, she was very willing to show us what we wanted to see and to research the history of the properties. If we had questions regarding property taxes, property boundaries, etc., she either knew or was on the phone getting answers for us. Mrs. Baker was and is invaluable in helping us find people to help with our redecorating, repair and handyman projects. Had the seller's agent been so diligent, it would have made the process so much easier. I give my highest recommendation to Barbara Baker as a residential and investment specialist. Ms. Baker worked very hard finding and showing me homes exactly according to my requested guidelines. She spent a considerable amount of time searching for what I wanted, providing necessary information and straightening out the various bumps in the road that arose along the way. …In fact, she kindly continues to assist in helping me adjust to the area. Upon my first encounter with Barbara in my driveway I found her to be professional and friendly. She had seen my “For Sale by Owner” sign and was inquiring if she could be of any help. I told her my story. She listened. She understood. I was not in an easy position. I honestly was at wits end as to what to do. I had interviewed several agents but did not feel confident in securing their help in this transaction because of my difficult circumstances. I knew I needed someone very special. That special someone was undoubtedly Barbara Baker. Since we signed the listing contract months ago until close of escrow Barbara has been “full throttle” through every twist and turn and jump and road block and pothole and finally success. I have absolute confidence in Barbara and she has never let me down. I have no words to describe Barbara’s friendly and courteous attitude. She did not push us in choosing any property, and was extremely patient with us. She is very knowledgeable, is versed in using computer searches, not to mention that she knows the places in great detail. Our experience with Barbara was extremely pleasant, and we are happy with the result. Barbara worked with us every step of the way. She thoroughly checked and explained every situation for us.… She is ethical, honest, patient, and willing to go to any lengths to help her clients. We would definitely ask her to be our agent again. Barbara was extremely helpful during the negotiations. She really went to bat for our price and for inclusions. Barbara educated us about the area, promptly returned all calls and emails, handled the entire process - and allowed us to buy our home sight unseen from the state of Virginia. Barbara began by listening to our ideas (interesting concept) and then put that together with the attributes of the area that we were trying to achieve. She knew everything that was available and every detail about the property, thus wasting no time in showing us exactly what we described to her. Barbara is a person who enhances your life when you cross her path. She has knowledge, integrity, and works tirelessly until she gets what you want. WOW! Just a quick note to thank you for your help in buying a house in Sedona.… You were calm and professional, then terrific in holding our hands and baby-sitting us through the inspection-notice process (from 800 miles away). Please accept our profound thanks! My search for an agent ended when I spoke to Barbara Baker on the phone. I was impressed by the professionalism and customer focus Barbara exhibited in that first call. This was my first purchase in the United States and I would not hesitate to use Barbara as my REALTOR® in the future. In my opinion, regardless of the transaction size, you can expect very personable and reliable service from Barbara Baker. Barbara has done an exceptional job in the sale of our two properties. …She is very personable, on the ball and very responsive. …She always kept us informed and up to date on all transactions during the sale process. She even helped us to find contractors to do some of the items required by the sale. Our lives changed the day Barbara Baker responded to our e-mail. Barbara took our dream and made it her mission to see that dream come true.… With Barbara you get her knowledge, experience and tenacity as well as her uniquely charming and warm personality, that lets you know you're in good hands through the whole process. Barbara Baker and her team represented us in our recent purchase of our Sedona home. We lived out of state at the time of the purchase, Barbara and Team worked hard to facilitate the transaction despite our being at such a distance. They stayed in close contact with us, and walked the purchase through every stage of the transaction process. It was a complicated purchase agreement, but they navigated through the complexities of the deal and made sure that our interests were well represented at every turn. Barbara Baker's Team is hard to beat, especially in the rarified Sedona real estate market that she knows so well. A consummate professional.… Tenacious. Honorable. Motivated. Highly intelligent. Barbara Baker makes things happen when everyone else is moaning about their individual issues.… There is little I can say negative other than to stay out of her way if you don’t want things to get done. She’s going to get them done, no matter what. Barbara doesn’t know how to take no for an answer, nor does she know the agony of defeat.… What a pro! Even though I live in Michigan and Barbara lives in Arizona, I feel like we have met. She helped me in so many ways all through the sale of my property. Barbara has been masterful in helping minimize the challenges of a home search from across the country. She has knowledge of the Sedona market and of individual properties so she can easily provide information that one cannot ascertain from the listings. She made special arrangements for us to see properties that had been taken off the market. Once we found our house Barbara took expert charge of all of the items that led to the closing. Her attention to detail and facilitation of communications with the many others involved made for a smooth process. We knew what was happening every step of the way, felt very confident that we were well informed and that our best interests were being managed. Our house was sold in 33 days. 33 days in this market. Photos were extraordinary. Wouldn't trust my business to anyone else but Barbara Baker. I cannot say enough about Barbara Baker, she is very professional, and well informed. She has keep me informed all through the sale of my property. She helped me in so many ways, She is very thoughtful and caring. Even though I live in Michigan and Barbara lives in Arizona, I feel like we have met. I would recommend that if anyone would like a professional realtor, to give Barbara a call... Thank you! Barbara Baker is the best local agent in Sedona. As a top REALTOR® on the East Coast, I have sold over 20 homes a month on a regular basis, and when it was time to buy a property in Northern Arizona, I chose Barbara to be my agent. She is the best there is, and I know the difference. Barbara educated us about the area, promptly returned all calls and emails, handled the entire process - and allowed us to buy our home sight unseen from the state of Virginia. She is an incredible REALTOR® with a great sense of professionalism and lots of contacts in the area. She handled everything for us and we feel very lucky to have worked with her. …You went above and beyond what was expected. Because we lived in another part of the state during the escrow, your exemplary work ethic kept things much simpler on our end. In addition to verifying that all of our requests received proper attention, you even oversaw things we did not know to look for! We would not have known to ask for landscaping to bring the yard up to code. Also having the receipts for prior work performed on the property lets us know who to call should the need arise. Your helpful recommendation of subcontractors has been equally useful as well. If you're taking a look at Oak Creek Canyon real estate, you have your eye on living in the full majesty of nature. Oak Canyon homes and condos don't just offer spectacular views, they provide you with the chance to immerse yourself in the wild and to experience nature in its purest form. From the colorful rock formations of Wild Horse Mesa and Horse Mountain to the Coconino National Forest, there are endless opportunities to enjoy these spectacular surroundings. 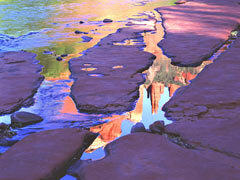 Oak Creek Canyon has more to recommend it than natural appeal, however. This small community is truly close-knit, offering residents the chance to build real connections and friendships while enjoying the beauty of the land. Many of the residents commute to nearby Sedona, but choose to live in Oak Creek Canyon condos and homes because the easy drive and the amenities of the town itself offer them all that they need. With Oak Creek Canyon homes available both in the town as well as along the Creek, residents can choose just how immersed in nature they wish to live. Oak Creek Canyon homes have a rich history. The Canyon itself is well-known, and is often referred to as a smaller cousin of the Grand Canyon. Carved over the millennia by Oak Creek, a tributary of the Verde River, Oak Creek Canyon experiences a different climate than most of the high desert surrounding the area, with a wider range of seasons and cooler temperatures. Thanks to this unique ecology, the creek and the rock have allowed for woodlands to prosper, and there are distinct seasons and wildlife here that create a novel environment for Oak Creek Canyon real estate. Easy access to Slide Rock State Park is a favorite activity for many locals, with opportunities for fishing, swimming, and hiking among some of the most beautiful natural water and rock features in the entire country. While the area has been occupied for centuries, the first permanent settlement began in 1879 when farmers and ranchers began to move into the region. The cooler climate, as well as its higher moisture levels, allowed for the growth of apple orchards. As the years went on, the area's scenic views made it a choice location for the setting and filming of many movies set in the American West. 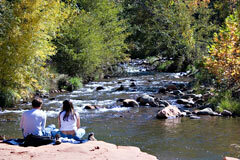 Today, Oak Creek Canyon condos and homes have a sense of their history as well as of their future. Attracting visitors from around the globe, Oak Creek Canyon real estate offers world class dining, shopping, and luxury amenities. The Verde Valley Musical Festival is an annual event near Oak Creek Canyon homes, with big-name headliners performing to raise money for scholarships. With the arts in town as well as offerings available in the nearby Sedona area, Oak Creek Canyon homes offer the best mix of nature and civilization. Oak Creek Canyon is a wonderful place to set down your roots, and there has never been a better time to invest in the area. Oak Creek Canyon is well-known for its scenery, but its homes offer their own beauty and charm that are not to be ignored. With so many options available, you are sure to find your perfect home in Oak Creek Canyon. Call or text me at 928-301-0669 or email me to find out more about this beautiful area and the many varied homes available in Oak Creek Canyon from the Sedona Real Estate Market.